The world's oldest marathon runner is set to join more than 27,000 people taking part in the 10th Edinburgh Marathon Festival. 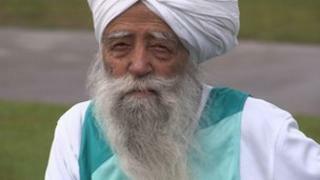 Fauja Singh, 101, retired from running full marathons following his eighth marathon in London in April but he will be taking part in the Edinburgh relay. As well as the relay, there will be a full 26 mile marathon, a half marathon, a 10K, a 5K, and junior races. It is the biggest running event in Scotland. It is second only to London in UK marathon size. This year's Edinburgh marathon features a line up of some of the finest athletes in the world. Among those on the start line will be Zachary Kihara, 33, of Kenya who holds the course record, crossing the finish line in 2:15:46. Since the Edinburgh Marathon started in 2003 it has had an economic impact of more than £25m for the Scottish capital and has helped raise more than £30m for hundreds of charities. Together with the Edinburgh Marathon's official charity Macmillan Cancer Support and hundreds of other charities the 10th anniversary organisers are hoping to break all previous records and raise more than £4.5m in 2012. Neil Kilgour, Edinburgh Marathon Festival race director, said: "It's hard to believe that a decade has gone by since our first event in 2003 but we're delighted that we have developed into one of the UK's and Scotland's major running occasions. "Edinburgh Marathon Festival has it all - a great city that acts as a stunning backdrop to the event's proceedings and a programme of races that means that everyone is catered for from children to marathon veterans. "We're looking forward to a great 10th birthday and welcoming back the thousands of runners who've supported the event over the years plus the thousands who will be joining us for the first time."